Hearts is a 4-player trick-taking card game. It has Spanish origins from around the mid 1700s and is said to have evolved from a game called Reverse. Hearts has gained increasing popularity due to Microsoft adding the computer-game-version of Hearts to its Windows operating systems. The object of Hearts is to finish the game with less points than your opponents. It is a must-know card game and is fun for all ages. All you need is a standard deck of 52 playing cards and a notepad/pen to keep score. Deal all 52 cards out in turn so each player ends up with 13 cards. Each person will then choose 3 cards in their hand to pass to another player. These are cards that the player just doesn’t want, or thinks will be damaging to another. For the first hand, these “pass cards” are to be handed left. The second hand they go to the right, the third are passed across, and for the fourth hand no cards are passed. After that, the cycle begins again (left, right, across, no pass…..). Hearts is a trick-taking game. 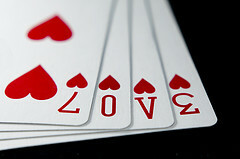 In hearts, a trick is the group of 4 cards that have been laid face-up by each player. A trick is like a round. Each hand will have 13 tricks (rounds) because that is the amount of cards each player has. In the beginning of the hand, the person who has the 2 of clubs starts the trick. So they will lay their 2 of clubs face up in the center of the table. In a clockwise fashion, the other 3 players must lay down any club card that they have (they have to follow suit with the leader). The person who laid down the highest club card (ace is the highest) earns the trick. So that player will take the 4 cards and put them in a pile next to them face down, then lead the next trick. After the 2 of clubs, the person who earned the previous trick starts the next trick with any card they want (except for hearts). If you can’t follow suit with the trick, you can lay down any card you want. For example: Let’s say I am to the left of the leader and he/she lays down a 7 of diamonds. I have no diamonds in my hand, therefore I can play any card I want. Typically, it will be a card I want to get rid of or something that will give points to another player. So let’s say I lay down the jack of hearts. The trick is still diamonds even though I played a heart and the 2 players after me still have to lay down diamonds if they have any. You can only begin (lead) a trick with a heart card if a heart has already been put into play for that hand. Scores are tallied in between each hand by counting the points accumulated in each player’s pile of earned tricks. Any heart card is worth one point, and the (dreadful) queen of spades is worth 13 points. Don’t get caught with that nasty queen! Therefore, 26 points will be accounted for after each hand (13 heart cards plus the queen of spade’s 13 points). Remember, points are bad. Get the least amount of points as possible! As a group you can decide the amount of points you will be playing to, but it is usually 100. So once a hand ends and a player has accumulated 100+ points, the game is over and the person with the least amount wins the game. Shooting the Moon: This is when a player earns every single point (26 total) in a particular hand. A player who has shot the moon can either give everyone else 26 points, or can subtract 26 points from his/her own score. Successfully shooting the moon is usually very difficult and can lead to a lot of points if failed. 3-player hearts – Remove the 2 of diamonds and then pass all the cards out so each player gets 17 cards. Then continue like normal. The other variation is to remove one random card before dealing, and then the player who earns the first trick also gets that card. 5-player hearts – Remove the 2 of diamonds and the 2 of spades before dealing cards. Each player will get 10 cards. Omnibus variant – If you earn the jack of diamonds, 10 points are subtracted from your score.